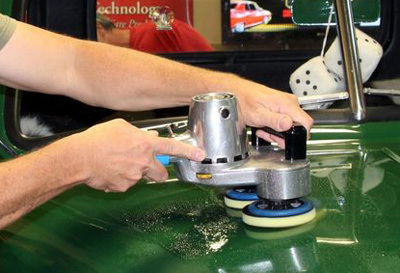 Use your Cyclo polisher to remove surface contaminants! Removing above-surface bonded contaminants like tar, paint overspray, tree sap, and industrial fallout is arguably the most important step in preparing your vehicle for polishing. The Cyclo Nanoskin Autoscrub Pads enable you to use the power of your Cyclo polisher to remove the aforementioned contaminants, making the traditional method of doing it by hand with a clay bar obsolete. Achieving smooth, contaminant-free paint has never been this easy, until now! The Cyclo Nanoskin Autoscrub Pads are constructed of durable open-cell foam with one side coated in an advanced rubberized polymer. As your Cyclo polisher rotates, this rubberized polymer coating shaves off above-surface contaminants, leaving the surface smooth and ready for polishing. Cyclo Nanoskin Autoscrub Pads attach to your Cyclo polisher with a durable hook and loop backing. Cyclo Nanoskin Autoscrub Pads last up to 5 times longer than a traditional clay bar. Best of all, if you accidentally drop one on the ground, simply rinse it off with water! Use the Cyclo Nanoskin Autoscrub Pads one time and you’ll wonder how you ever detailed without them. Using the Cyclo Nanoskin Autoscrub Pads is simple. First, attach the pads to your Cyclo’s backing plates. Working on panel at a time, spray an approved lubricant, like McKee's 37 Universal Clay Lubricant, directly onto the surface. With the machine turned off, place the pads flat on the surface. If you have a Cyclo Model 5 Pro, adjust the speed to a lower setting and turn the polisher on. Make several passes using a medium arm speed. Inspect the surface using your hand placed in a plastic sandwich baggy. If it feels smooth, wipe off the lubricant and move on to the next panel. It’s that simple! Cyclo Nanoskin Autoscrub Pads are available in FINE and MEDIUM grades. The fine grade is ideal for vehicle’s that are fairly new or well maintained. The medium grade is perfect for older or heavily contaminated vehicles.